My colleagues and I at A2L work hard to be thought leaders in the litigation consulting and visual persuasion industries. So, it is fortunate that we are invited to speak at quite a large number of events every year. 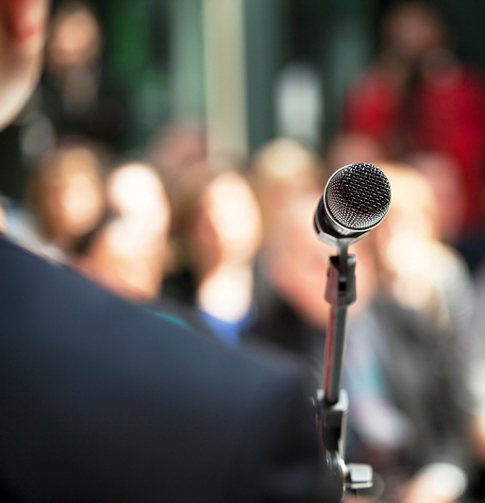 Not only do we speak at the legal conferences you'd probably guess we do, but we also have the opportunity to speak at CLE's, litigation lunches, partner retreats, online webinars and even non-legal industry conferences. In the past several years, I have participated in many such events in the legal industry. However, some of the most interesting events for me have been speaking at Salesforce.com's Dreamforce conference about professional services firms using salesforce, HubSpot's Inbound marketing conference about how to get started with content marketing, and one event I'm looking forward to in particular is a commencement address for the graduate campus of the University of Mary Washington next month. My colleagues and I enjoy speaking, because we love what we do. Speakers at A2L Consulting include business experts, marketing experts, jury consulting experts, witness prep experts, visual persuasion experts, experts at communicating about science to lay audience, experts in PowerPoint usage and much more. Using a combination of traditional travel and modern videoconferencing, we speak at events around the world. For the vast majority of events that we participate in, we do so at absolutely no charge. In general, law firms, government agencies and corporations will cover out-of-pocket costs for CLE registration and travel where applicable. I think these events are a win-win for everyone involved. 1. Using PowerPoint Litigation Graphics to Win at Trial: We have a CLE already approved in a number of states related to this topic. We also recently conducted a webinar version that is similar to the CLE. Watch the webinar PowerPoint litigation graphics webinar anytime here. 2. Building Persuasive Visuals: For many years, we have been creating persuasive visuals outside of the courtroom environment. These visual persuasion devices are being used in lobbying presentations, to help motivate executives to take action, to influence the general public and much more. To learn more about building persuasive visual presentations, download our e-book, How to Build Persuasive and Engaging Presentations. 3. Storytelling for Litigators: There is good science that supports the use of stories when persuading an audience. It's something that great litigators know intuitively, and it is something that any litigator can learn. We recently conducted a free online webinar called Using Storytelling as a Persuasion Tool that can be watched free anytime. 4. How to Make and Use Powerful Trial Timelines: We have released a free e-book called The Litigation Guide to Trial Timelines, and this is a topic no courtroom-focused professional can avoid. Timelines are used at almost every trial, and making a good one is quite hard. 5. Patent Litigation Graphics: Patent litigator Ryan Flax amazes new and veteran patent litigators by showing what works in patent litigation demonstrative evidence. He is a visual persuasion expert and contributed to more than $1 billion in jury verdicts while practicing. He recently conducted a free online webinar called Patent Litigation Visual Persuasion Techniques that can be watched here anytime. 6. Communicating Scientific Concepts to a Lay Audience: We work with leading scientific consultants frequently. In a soon-to-be-announced free webinar, we'll discuss how to pick the best experts and how to communicate scientific concepts to judges, juries and the general public. In the meantime, we have a great e-book called Using Science to Prevail in Your Next Case or Controversy. 7. Antitrust Litigation Graphics: As we recently wrote about in the just released Antitrust Litigation Guide to Trial Prep and Trial Presentation book, antitrust is a very challenging area for juries. The challenge of explaining economics, charts, graphs and equations is frequently underestimated by antitrust litigators - even in bench trials. 8. Environmental Litigation Graphics: We consult on a lot of environmental litigation at A2L. There are common challenges from case to case that mostly have to do with helping experts in their testimony. We cover these topics and more in a related e-book The Environmental Litigation Trial Presentation & Trial Prep E-Book. 9. Labor & Employment Litigation Graphics and Trial Consulting: Some of our team will be speaking to a government agency about this topic this week, and they are looking forward to it. 10. Construction Litigation Graphics: It's been a few years since we presented at the Construction SuperConference, but our work in construction delay and defect cases has continued unabated. Here are some related construction litigation blog articles. 11. How to Use Jury Consulting in a Valuable Way: Jury consulting is a misnomer for describing what we do. Our work frequently includes mock bench trials, mock appeal hearings, and witness preparation in addition to the traditional jury selection and mock trial services. Learning about how best to use trial consultants is a very valuable topic for litigators. We discuss many of these topics in our free Trial Consulting Handbook for Litigators. 12. Life in the New Normal Legal Economy: We have written articles about alternative fee arrangements that we use, suggestions for in-house counsel on setting up preferred litigation support vendor programs, penned a series of articles targeted at emerging midsize litigation law firms, and have released a book about the New Normal Legal economy. It's a topic we clearly enjoy speaking about even when sometimes it makes us all a bit uncomfortable. 13. Why Are So Many Opening Statements Ineffective: They don't have to be long to be strong, you should never say "I'll talk about that later," and what has to be accomplished in the first 5 minutes or you'll likely lose your case are all topics we are passionate and knowledgeable about. 14. How to Really Assess and Prepare a Witness: We write about witnesses often, both lay and expert. Getting either prepared is something our people have done for decades. We have thousands of accumulated hours preparing witnesses and a correspondingly long list of tips and secrets to share. I think this article and this one do a good job describing our feelings about witness prep and witness testimony. 15. How Important it is to Look at Non-Verbal Behavior in the Era of the Video Deposition: I am still stunned by watching the performances in these depositions, particularly the Justin Beiber depo. Learn how to manage your client from our experts. Sometimes it is easier, better and cheaper for an outsider to prepare the witness, and we'd love to discuss what we have learned from those experiences. 16. Why Lawyer-Generated Graphics Don't Work: We don't want artists to practice law any more than we want lawyers preparing graphics. There are dozens of reasons for this, and we are happy to share them. Here's a blog post to get the ball rolling on lawyer-prepared graphics though. 17. E-Briefing and Brief Writing in the Era of the iPad: Did you know that the way people read a page of text has changed in the last ten years? If you are still writing briefs the same way you did fifteen years ago, you're missing some easy opportunities to persuade quickly. Take a look at this discussion about ipads and hyperlinked e-briefs. If you would like to discuss a member of A2L's team speaking at your next event or have any other questions, please contact A2L's Director of Operations, Alex Brown at brown@A2LC.com or 800.337.7697 x121. We try to say yes to everything that we can given our hectic schedules. Whether it is a litigation lunch via video conference, an in-person CLE or whether it is a conference speaking opportunity, we would love to hear from you.